A fabrication project constructed out of laminated lumber and hand-stained, questioning interior/exterior relationships as well as looking into part to whole relationships. 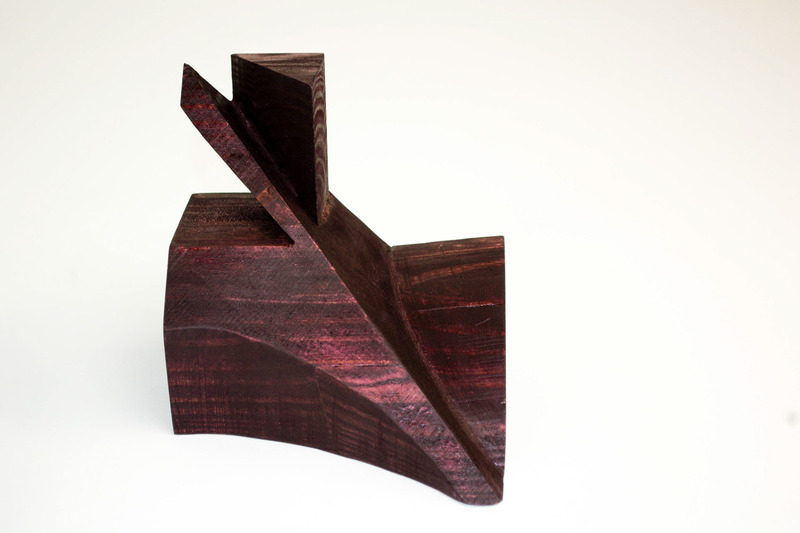 The Cube is a fabrication project that was created from a single 5" x 5" block of wood. The block of laminated wood was then cut into three individual pieces, each identical to the next. These three pieces come together to create the whole cube and fit perfectly into each other. The cube sheds a new light on part to whole relationships and begins to show a less rigid dogma than what is expected from interior to exterior. The cube's form begins to show a curious imbalance with a single diagonal line cutting down the center of one piece. The exterior shows an interesting breakage at the corner, alluding to the inside of the cube and creating a dichotomy between the pinpointed area of breakage on the exterior and the imbalanced pieces on the interior. The relationship between the interior and exterior explores the indexicality that can be planned and manipulated as one wishes. The process of creating the cube begun with numerous foam cubes. The cubes were cut into three pyramids that became one singular cube. They were then cut into in order to create different forms and variations of addition and subtraction within the pieces. The individual piece itself has a cohesiveness that begins to tie in the triangular chunk which juxtaposes the soft curving void on the opposite side.